Up Your Off-Duty Game | Valet. We know that Suitsupply excels at offering well-crafted suits and jackets, cut from luxe materials and expertly tailored for modern guys. But these days, we don't simply want suits and blazers and proper trousers, do we? There are plenty of times in a man's life when you opt for something softer and more relaxed. And Suitsupply knows that. So they went out and created a line of luxe leisurewear that's sharp and still well-tailored but plenty chill. 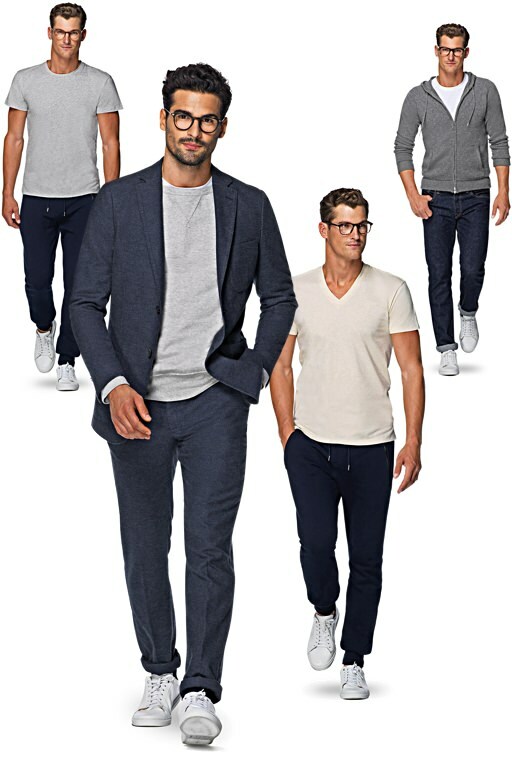 The collection of the sweatpants and just-long-enough split-hem tees are cut from soft, high-end cottons and cashmere. They're the ideal off-duty staples that, as you can see from the models here, can easily be paired with the rest of your wardrobe for an of-the-moment look that toes the line between casual and dressed-up. Take your off-duty kit to the next level. Kicks you can wear anywhere with anything.